To start the battle with Jet Mobile (ジェットモービル) at the end of Mushroom Hill Zone Act 2, jump on the satellite dish to destroy it. This will reveal Dr. Robotnik's heavily armoured Eggpod. If you can hit his craft a few times before he moves offscreen, the battle will be easier to win. When Robotnik flies off to the right, chase after him and follow him through an obstacle course comprising rows of spikes which the player must jump over/between to avoid (when playing as Knuckles the Echidna, there is an additional spike pattern that requires him to glide). If you keep running, you'll catch up with Robotnik. When he switches off the boosters, you can hit him. 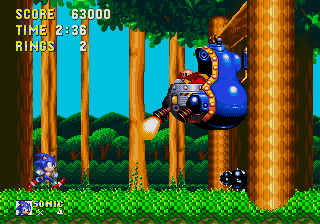 If you have a Flame Shield, the boosters' flames won't hurt you, so you can attack Robotnik repeatedly. If you're fast enough, you can hit his craft directly from below, avoiding the risk of collision with the boosters thus allowing you to score a hit whether they are on or not. After eight hits, Robotnik's machine starts to explode, but he doesn't look too worried. However, the Eggpod soon crashes into a tree and its armour falls off. After freeing the animals from the Egg Prison, the character will look up and see the Flying Battery Blimp fly past. Robotnik flies up in his now-basic Eggpod and enters the battleship, which the player then jumps and grabs onto, following him to the next Zone. 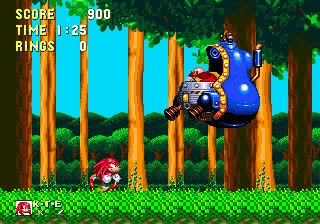 When playing as Knuckles, if you lose a life during this battle, a bug/glitch causes the boss to sometimes display as Robotnik instead of Eggrobo upon beginning a new battle. A worse oversight occurs in Flying Battery Zone, where Knuckles always battles Eggman for the entirety of the second and final boss battle.